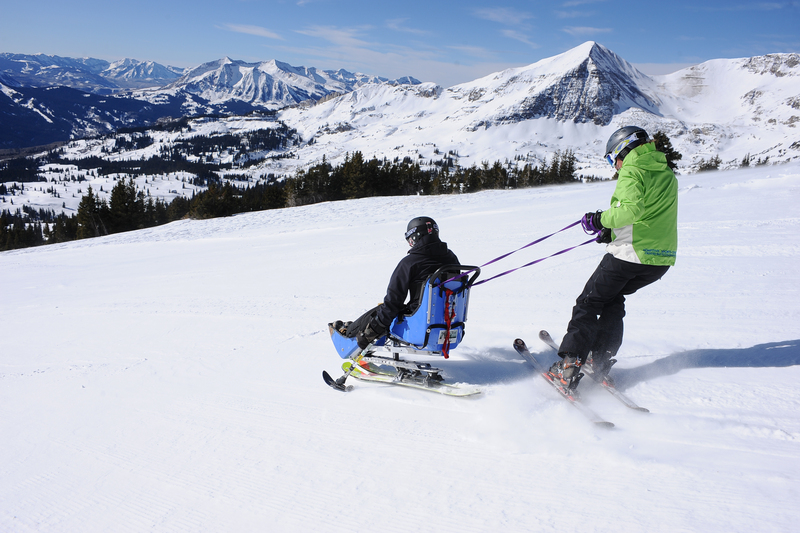 Craig Hospital Certified Therapeutic Recreation Specialists (CTRS), volunteers and local outfitters have coordinated adaptive skiing trips around Colorado since the 1970s. These outings started out as day trips to Winter Park, one of the only resorts equipped with an adaptive skiing program at the time. Today, it would be very unusual to find a resort that doesn't have an adaptive skiing program. Over the years, the program and sport have evolved. Craig began offering overnight trips and the sport has gone from "sledding" to actual skiing thanks to the evolution of adaptive equipment. The first adaptive sit ski was based on the Norwegian design called a “pulk.” The sled had metal runners on the bottom that sit directly on the snow. For control, sit skiers held a long kayak style pole and made pushing, pulling, or dragging movements to complete a turn, to slow down, or to stop. These days, just about anyone can go skiing. There are different varieties of skis for varying levels of injury and ability. Bi-skis, mono-skis, and dual-skis can be fitted to the person's body, ability, and skill level. Some of the newest equipment includes sip and puff technology which allows people with high-level quadriplegia to be independent in their skiing. "For patients who have recently discharged there is often hesitation to engage in “adventure” type activities or travel," says Tom Carr, Director of Therapeutic Recreation. "This is the reason for the Craig Adventure Program and for trips like adaptive skiing. We want to facilitate a positive first experience where our alumni can gain the confidence and skills needed to participate in these activities independently with friends and family." Therapeutic Recreation, like many of the programs that contribute to Craig’s unique Culture of Care, is not covered by insurance companies and relies on charitable support to offer services to Craig patients, grads, and their families.